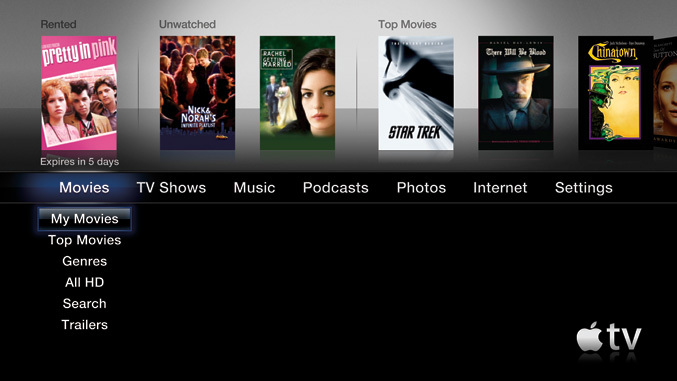 Apple® introduced new Apple TV® 3.0 software featuring a redesigned main menu that makes navigating your favorite content simpler and faster, and makes enjoying the largest selection of on-demand HD movie rentals and purchases, HD TV shows, music and podcasts from the iTunes® Store even better on your TV. You can now enjoy iTunes Extras and iTunes LP in stunning fullscreen with your Apple TV, as well as listen to Genius Mixes and Internet radio through your home theater system. The new Apple TV software is available immediately free of charge to existing Apple TV owners, and Apple TV with 160GB capacity is available for just $229.